For over a year and a half I have been working on Mueller matrix microscopy. 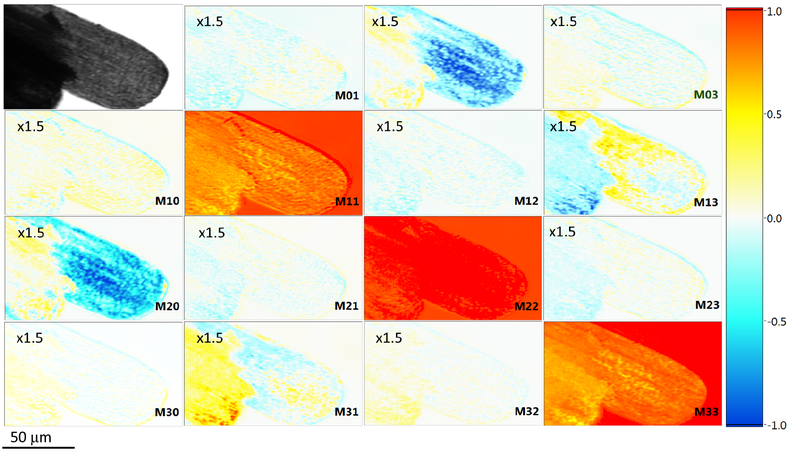 Now I can say that I have no doubts that, when it is properly implemented, Mueller matrix microscopy is nothing but the perfect upgrade for polarization microscopy. I know polarization microscopy is not the most trendy technique in these days, but polarization microscopes are so widespread that even if only a tiny fraction of core polarization microscopy users become aware of what Mueller matrix microscopy can offer, the usage and the applications for Mueller matrix microscopy will grow exponentially. Detail of the scale of a Morpho butterfly captured with a Mueller microscope. With this objective in mind we have been working in the last few months on a compact, table-top prototype of a Mueller matrix microscope. 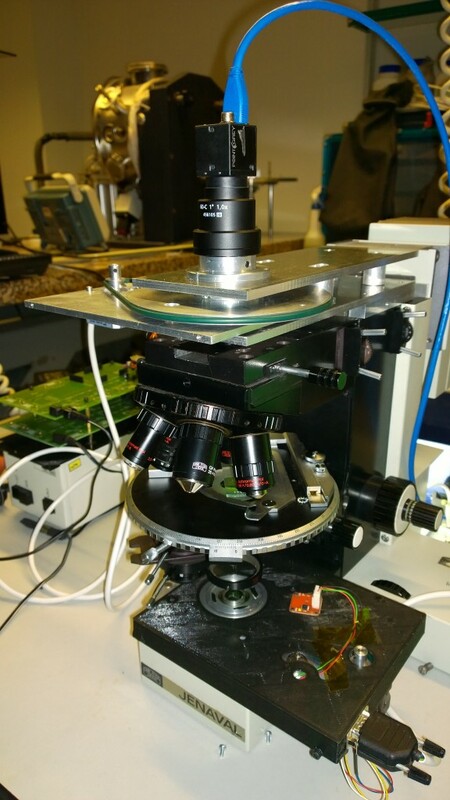 The skeleton and the optics of the instruments are based on commercial polarization microscope, but it has been heavily modified to work as a fully-automatized Mueller matrix microscope. The aim was to keep all the advantages of polarization microscopy, with a very compact instrument in which it is very easy to manipulate the sample and find a focus but, at the same time, all the power of Mueller matrix analysis is just available after a “click”. The working principle of this Mueller microscope was described in Oriol Arteaga, et al. “Mueller matrix microscope with a dual continuous rotating compensator setup and digital demodulation,” Appl. Opt. 53, 2236-2245 (2014). Photo of our benchtop Mueller matrix miscroscope. It is based on classic ZEISS Jenaval microscope that has been modified. The project is being carried with the technical collaboration of A.COLOMA Microscopios y Aparatos Ópticos and we work together to offer complete solutions for Mueller matrix microscopy. 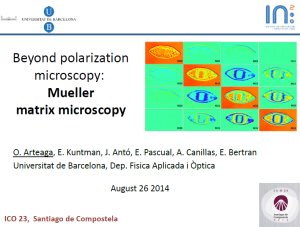 At this early stage, you can contact me (oarteagaATub.edu) or Francesc Gomez (fxgomezATacolomamicroscopis.com) in case you are interested on getting a Mueller matrix microscope or if you would like to make a custom modification on your polarization microscope. UPDATE! Click on the following image the pdf version of a presetation about MM microscopy that I did some time ago. This entry was posted in Uncategorized on January 3, 2015 by loiro. It is time to welcome 2015. This New Year should be specially interesting for us since it is the International Year of Light and Light-based Technologies. The International Year of Light is a global initiative adopted by the United Nations to raise awareness of how optical technologies promote sustainable development and provide solutions to worldwide challenges in energy, education, agriculture, communications and health. From this tiny spot I hope I can contribute with a grain of sand to these goals by showing how a property of light that we can not perceive, polarization, becomes our tool to investigate many properties of the world that surround us. After a long time without updates, I have just renewed the design of the website. My New Year’s resolution should be to update this website much more often.